This hardly counts as a recipe, but it's something I make all the time and it's really popular. For parties and barbecues etc, it's so nice to have a really fresh homemade dip. This one is really easy to make and costs a fraction of what you would have to spend to get the same quantity of a shop bought salsa. It's really good with tortilla chips or homemade potato wedges. Quantities above are all approximate and I never measure when making this at home, just adjust to suit your own tastes, but the above should work fine as a starting point. 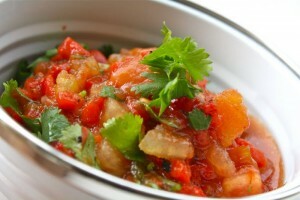 Wash the tomatoes, chilli and coriander, deseed the chilli, and peel the red onion. If you have a food processor, just blitz the tomato, onion, chilli and coriander to the desired size then add lime juice and sugar to taste. (Tomatoes can sometimes be a little bitter so a pinch of sugar can help balance things out). If you don't have a food processor, then chop all the ingredients finely and mix together. Cover and chill until needed. This will make quite a lot, so if there are only a couple of you then reduce the ingredients to suit.